The folks over at the Digital Ethnography site (who do some fascinating work) created this video about what college students are really saying and experiencing in their lives in this digital age. They used a Google Docs to have more than 200 students edit a document and create surveys of each other. Since my good friend, The Reflective Teacher, is taking a break this week from his wonderful Boil Your Day Down Into One Sentence feature, I told him I would be glad to host this week’s edition. So, if you want to participate, use the comment feature here on this post, write and submit your sentence (and even better, write your sentence and also provide me with a podcast version — you can even email me the audio file at dogtrax(at)gmail(dot)com and I will host it for you), and I will collate it all before the end of the weekend. I read about this Reactable instrument somewhere and then I found these clips on YouTube (where else?) and I am not sure what to make of it. It is called a “tangible interface” instrument, which means that you manipulate the sounds with objects and space between the objects, on a surface board of light and electricity. It reminds me of a professor I had in college who had been part of the New York City experimental music scene and then ended up in our dinky little college. He used to have us create all these different sounds, using different tonal patterns and (gasp) reaching into the grand pianos and plucking strings, banging on parts, etc, as a way to get beyond the traditional aspects of composition. We often did this with the door closed so that the other music teachers would not see us, since putting your hands in the guts of a grand piano is often a huge no-no. I remember composing this very bizarre piece for prepared piano and soprano sax — I worked hard at it, trying to get it just right — and when we played it live, it was as if I were in another world. We shook off melody and harmony in order to achieve something new. The Western Massachusetts Writing Project is hosting its annual Best Practices this coming weekend, which not only allows our folks from the Summer Institute to shine as workshop presenters but also showcases much of the work that the organization is doing. I am giving a workshop presentation on podcasting and my hope is to post some of the audio we record at this blog and at our WMWP Newsletter blog. We also have a great local writer — Leslea Newman, author of many books for kids and adults — who will be leading a writing event for all of the day’s participants. Why Write in Math? Communicating the Metacognitive Process of Problem Solving. Thinking and Rethinking Strategies for Working with English Language Learners. Thoughts in the Looking Glass: Reflective Writing in the Classroom. Steve H., whose creation of Classroom 2.0 got me interested in Ning social networking platforms, just published an article about Web 2.0 in education and in an accompanying wiki companion to his article, he features folks who are using different tools in the classroom. I had responded to Steve’s initial request for folks using tech in the classroom, andI wrote a bit about using a Wiki to create a collaborative dictionary with my sixth graders. So I find myself in good company on Steve’s list of teachers. You can view all of the teacher profiles and projects that Steve is featuring at his own wiki site. There are some great ideas there and inspiring teachers for all of us to follow. 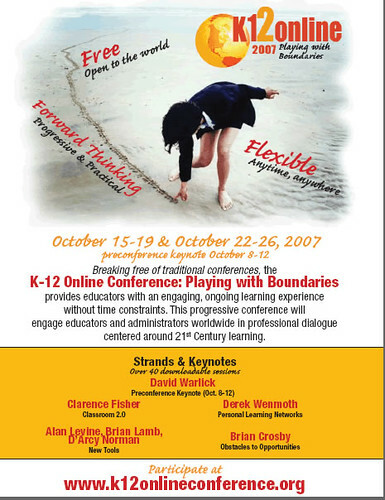 The 2007 edition of the K12 Online Conference begins today with a keynote podcast by David Warlick on the theme of “Inventing New Boundaries.” Here is a full schedule of events for the virtual conference. The K-12 Online Conference invites participation from educators around the world interested in innovative ways Web 2.0 tools and technologies can be used to improve learning. This FREE conference is run by volunteers and open to everyone. The 2007 conference theme is “Playing with Boundaries”. This year’s conference begins with a pre-conference keynote the week of October 8, 2007. The following two weeks, October 15-19 and October 22-26, forty presentations will be posted online to the conference blog (this website) for participants to download and view. Live Events in the form of three “Fireside Chats” and a culminating “When Night Falls” event will be announced. Everyone is encouraged to participate in both live events during the conference as well as asynchronous conversations. Hope to have you there — there are plenty of great presentations on tap. David Pogue of the New York Times has posted a very positive review (and nice video, too) of the new XO computer that is part of the One Laptop Per Child effort to create an inexpensive, portable, destruction-resistant computer for children of the developing world. The machines are open-source, so no Windows, which may shock some folks but keeps the price reasonable. And they are also going to be offering up a buy-one-yourself/give-one-away-to-a-kid sale next month, and when I told my wife that I was toying with the idea, I think her reaction was a mix of “We need more technology in our lives?” and “Sounds like a good way to help children in the world” so we’ll see what happens. I got a call from a friend, asking me if I wanted to see Bruce Springsteen as he kicked off his Magic tour in Hartford, so of course, I said, heck yes. I think he is still going strong as a songwriter and the last time I saw Bruce live, he just amazed me with his stage presence and ability to command an entire audience from the stage. He is back with the E Street band, which is a mixed blessing. They can rock but it is all about loudness and power and not so much about finesse. Still, anytime a crowd of thousands gives a saxophone player a standing ovation for playing five notes, I have to cheer (as a sax player myself). The show was fantastic — a mix of new stuff from his new album (which is out today, I think) that is pop and also lyrically strong, challenging the Bush administration on the loss of basic rights and looking to a new future. The older songs also rocked, and the highlight had to have been an over-the-top version of Reason to Believe, an old acoustic song from the album, Nebraska. Here is a review of the concert. James Farmer sent out an email this morning, proudly announcing that the Edublogs network now has 100,000 edublogs. That is an incredible number, I think, and I hope that more and more teachers are finding their way to free Edublogs and its network (did mention it is free?). The web is a fantastic tool when it comes to distributing resources – all you have to do on your edublog is upload, or copy and paste, your materials to your blog and they’ll be instantly accessible by your student from school and from home. What’s more, you can easily manage who gets to access them through password and plugin safety measures. If you’ve ever struggled to create an online discussion space – you’re going to love what edublogs will do for you. Students can simply respond to blog posts and discuss topics you’ve set them without the added complexity of using a bulletin board – commentators can sign up to receive emails when their comments are replied to and you can easily manage and edit all responses through your blog’s administrative panel. Do you remember the good old days of class newspapers? Well, they just got a lot easier with your edublog – you can add students as contributors, authors and even editors in order to produce a custom designed, finely tuned and engaging collaborative online publication by your class. It’s all very good sending your students off to blog sites, or even creating them for them, but you need to operate as a hub for their work and a place where they can easily visit each others blogs from. Your edublog can be used to glue together your students blogs, and besides which, if you’re asking your students to blog… you should certainly be doing it yourself. We all love planning and admin, right? Well, using an edublog can turn planning and reflection on classes into a genuinely productive – and even collaborative – experience. Sharing your plans, your reflections, your ideas and your fears with other educators both at your school and around the world using an edublog is a great way to develop as a teacher, and a brilliant use of a blog. With a couple of clicks you can embed online video, multimedia presentations, slideshows and more into your edublog and mix it up with your text and static resources. No cds required, no coding necessary – just select the video, podcasts or slidecast you’d like to use and whack it in your blog to illustrate, engage and improve your teaching toolbox. You don’t only have to use your edublog as a pedagogue… you can equally easily use the tools to organise everything from sports teams in your school, to rehearsals for the upcoming production. You can set up as many edublogs as you like, so don’t be afraid to use a dedicated one for a dedicated event – your can even use it as a record to look back on down the line. There’s nothing that says you can’t allow anonymous commenting on a blog (although you’re also entirely within your rights to put all comments through moderation!) but why not think about using a blog as a place for students – and even parents, to air issues, leave feedback or generally tell you how great you are. One of the great things about edublogs are that they are much, much more than just blogging tools. In fact, you can use your edublog to create a multi-layered, in-depth, multimedia rich website – that hardly looks like a blog at all. So, if you’d rather create a set of static content, archive of important information or even index for your library – you can bend an edublog to suit your needs.